One of the biggest challenges that builders in the Northeast face is the high cost of construction. Part of the challenge is just finding an affordable south facing land that has a good source of water, power nearby, and friendly soils that can support a septic system and allow for a foundation without blasting and installing lots of retaining walls. We are quickly running out of reasonably priced lots that aren’t full of bedrock and wetlands, heavily wooded, and loaded with protected wildlife habitat and rare species of plants. The average length of driveways and utility trenches is around 200, ’ but they can easily hit 500’ by the time all setback requirements and environmental buffers are satisfied. This is just a short list of variables that amplifies the cost. For example, a typical five-acre lot in the country will cost upwards of $10,000.00/acre and I’m being conservative. So, before we even get to the fun part of building a house, the budget is already strained because, in addition to the purchase price of land, the average budgets for lot improvements (tree cutting, stump removal and land clearing, excavation, backfill, driveway, water, sewer, power, landscaping) start at $50,000.00 but they can often go much higher when blasting or importation of fill and topsoil is required. Lately, some of our lot improvement costs for a single-family home have exceeded $90,000.00. In Vermont, even the most basic of affordable new homes (26’ x 36’ Cape or Colonial with unfinished basement and no garage) with three bedrooms and two and a half baths can cost close to $300,000. Investing in High-Performance premiums that will allow a home to perform with a HERS rating of Zero (Net Zero), the cost of these homes (not including cost of land or lot improvements) will be around $330,000. We are constantly aware of strained budgets during the design phase and are challenged to provide the highest quality of construction while trying to implement the most cost effective methods and ways to construct the house from start to finish. The first budgetary challenge that we encounter is the foundation in affordable zero energy homes. Topic: The balance between maintaining a Cost-Effective Approach while also (maintaining superior Energy Performance. 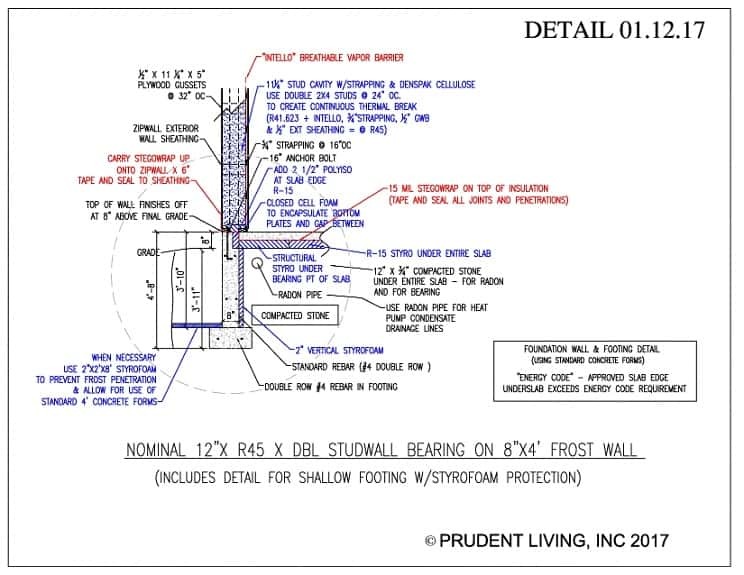 In Foundation Detail 01.12.17, you can see how Prudent Living, Inc., installs a very cost-effective and code-compliant foundation for a house that is built on a slab. These types of houses are referred to as “Slab on Grade.” That’s “builder talk” to describe a house that has no basement. In cold climates like the Northeast where we build, Prudent Living must make sure that its foundations are installed in such a way that any frost penetration will not adversely affect them. This means that we must prevent any frost from penetrating deeper into the ground than the depth of the foundation walls. When soils freeze underneath, they can lift a foundation. This will cause severe cracking and wreak havoc with its structural integrity. Even though frost is best known for penetrating vertically, it can also penetrate sideways through foundation walls and exposed slab edges. 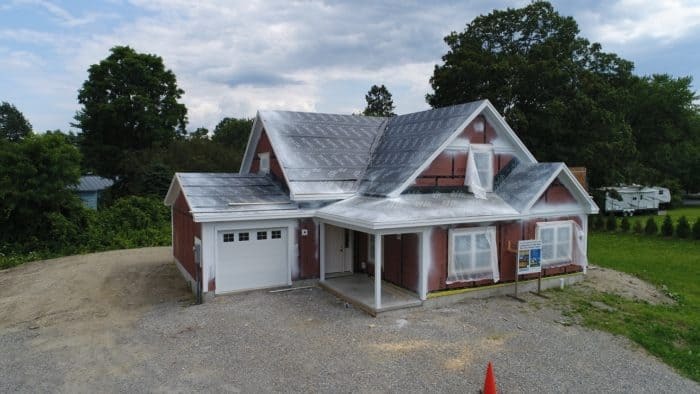 While this may not pose a structural threat, it can create other serious problems such as frost buildup and condensation inside the framework of the house. This provides a rich environment in which mold can grow – the kind of mold that shows up much later with blackened sheetrock walls and studs and a lot of serious health problems. In order to prevent this from happening, we position foam insulation between the foundation wall and the interior concrete slab, keeping them from coming into contact. This procedure creates a “Thermal Break,” a term that is used to describe how we prevent concrete surfaces from “telegraphing” or “conducting” outside cold air into the house where it can interact with warm temperatures and condense. The opposite of a “Thermal Break” is a “Thermal Bridge.” Thermal bridges are bad. “So, what’s so practical about going with this method of installing a High Performing Foundation?” you may wonder. Well, the savings for an average 1,500 SF foundation, when comparing our method vs. installing Insulated Concrete Forms (ICFs) is about $5,000 when considering that no exterior foundation protection or coatings are needed to protect exposed concrete, plus the average premium between using ICFs vs. using standard forms is about 50 percent. NOTE: After completing our case study for installing frost walls for a “Slab-on-Grade” house we want to acknowledge that when installing a full foundation that has a conditioned/heated basement, we believe that ICFs are the most practical and cost-effective, because Energy Codes get fussy with insulating an 8-foot concrete wall in compliance with their regulations. So, in order to comply with current energy codes, it’s just easier to use ICFs for spaces that will be heated. That’s because once ICFs are poured, they offer built-in fasteners on both inside and outside of the forms, making it very convenient to finish off the inside and protect the outside accordingly. But the reason we have focused this article on a “Slab-on-Grade” foundation is that all our houses at “Southscape” will be built on slabs. One of them is finished already. Give us a call and we’ll be happy to give you a tour.